Resurrected from the dusty corners of a hard drive, here we have the long-lost tracklists for all of the DJ sets from Global Goa Party 1: Love Gravy. 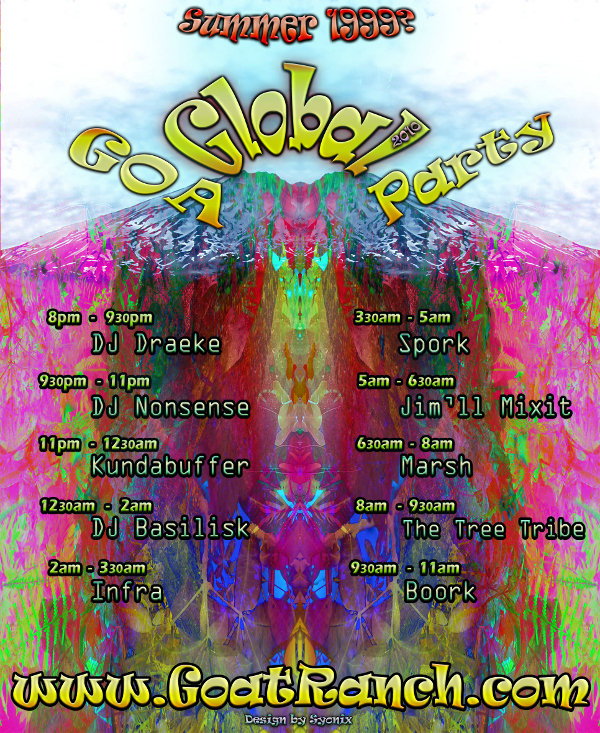 Welcome to the Global Goa Party! 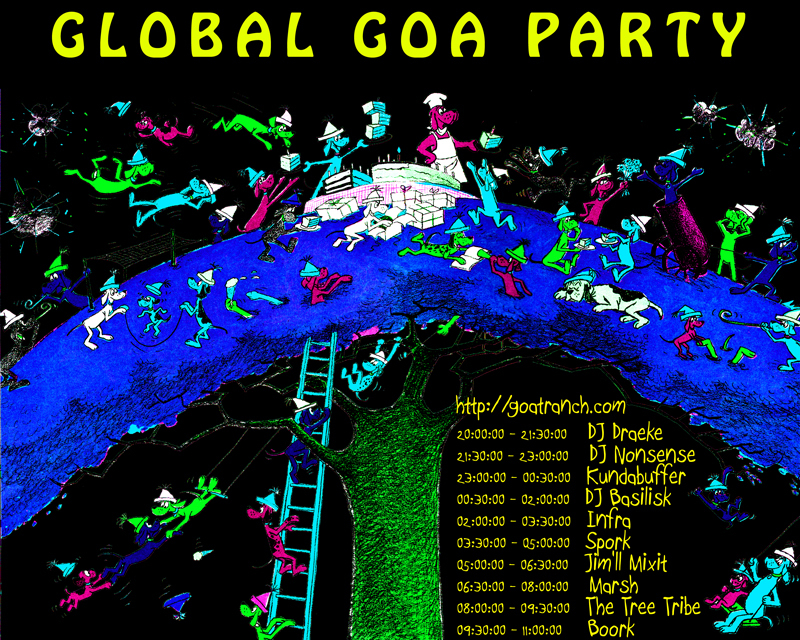 Global Goa Party – soon now! The Love Gravy mixes are starting to stream in, folks, and I’m hoping to have each DJ’s mix by the end of the weekend. Then comes the organizing, naming, tracklist gathering, stitching, and posting which may take another week or so (due to the holiday weekend here in the States, and then that whole dumb “day job” thing, and such). As mentioned previously, all mixes will be posted here on the Goat Ranch once they’re all in, but you can also hear the full party on Digitally Imported Radio’s Goa/Psy channel on July 17/18. Check out the DI.fm calendar page for more information on broadcast time for your timezone. I’m hoping to have all of the mixes here by July 4th, but if we have some stragglers, rest assured the show will most definitely still go on! Thanks to everyone so far for your interest, and thanks to detune for the killer flyer! This’ll rock some socks. While the DJs are busy assembling tracks and working on their mixes for the Global Goa Party, the gnomes have been busy spreading the word, and the word will be spread even further with the whole party being broadcast on Digitally Imported’s Goa-Psy Trance channel! We are still firming up details with regards to date and time, but I’ll be working with the swell kids over at di.fm over the next few days to nail down the specifics. Once we get the broadcast time nailed down I’ll post up another announcement here at the Goat Ranch. I’m hoping for a Saturday broadcast in mid-July, and we’ll likely start it at 8PM in whatever timezone has the most active listenership (if that can be determined). Special thanks to Syonix for the kickass flyer! This is the first of his two submissions, the “Global Goa Party” version. I’ll include the “Global Love Gravy” version in another party post in the near future, so stay tuned.